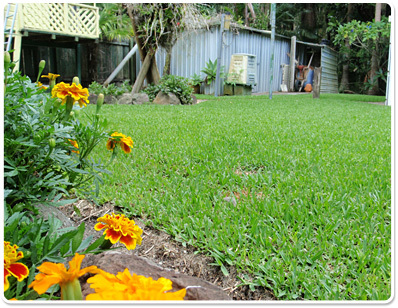 Start mowing once the turf slabs cannot be lifted from the soil. This indicates that the turf has established a strong root system. Turf is best mowed weekly at a length of at least 50mm in direct sunlight and 75mm in shaded or partially shaded areas. 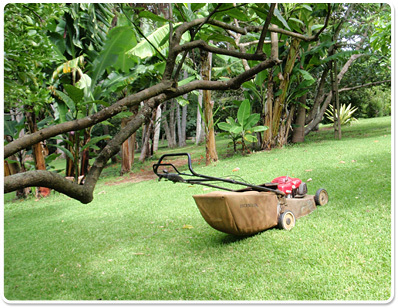 Do not remove more than one third of the leaf per mowing. Scalping or mowing too short can severely damage buffalo grass. To encourage deep healthy root systems, water turf thoroughly but not frequently, at lease once a week will be sufficient. In a prolonged dry period the turf will require additional watering. Automatic sprinkler systems should be set to a once a week cycle. In situations where the natural soil profile is deep, well structured and is high in organic matter the additional watering discussed above may not be required. In situations where the natural soil profile is sandy, additional watering will be required. Sandy soils will be improved by an additional fertiliser regime and applications of 'Wetta Soil'. A yearly application of 'Aglime' is required at 20kg per 100 square metres to improve soil structure. A yearly application of 'gypsum or dolomite' will be required on heavy clay soils or soils with salt problems. Soils from reclaimed areas such as canal subdivisions or where sub soil is close to the surface may also require this treatment. Gypsum or dolomite should be applied at 20kg per 100 square metres. Apply 'Crop King 88' fertiliser at 10kg per 100 square metres twice a year. After application, water area well. 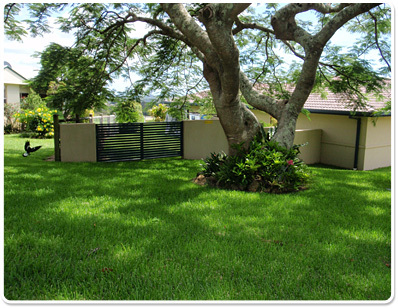 Soil test followed by a prescription fertiliser program may be needed where turf has been laid on problem soil or where a very high quality or high usage lawn is required. View other Installation and Maintenance pages or Contact Us for more info.